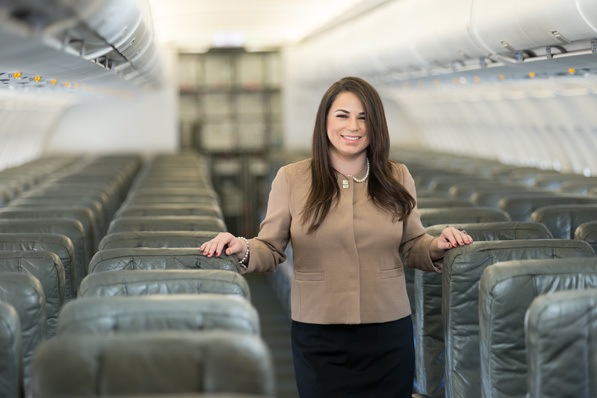 JetBlue's director of international airports, Gisele Cortes, on the airline's expansion and social responsibility efforts. Cortes, who has been with JetBlue for 12 of its 15 years, rising through its ranks, currently oversees operations in 19 countries and 31 airports, from Cancún to Lima to Port-au-Prince. In June 2015, the company will expand flights into its 90th city, Grenada (The Maurice Bishop International Airport). Cortes talks to HE about JetBlue’s international ambitions, social responsibility efforts, and cultural sensitivities. HE: Give us an overview of your tenure with JetBlue. GC: I began in an entry-level position reporting to finance, then worked for three years as payroll supervisor, and then payroll manager by 2008. In February 2013, I began to work in operations, and now I’m director of international airports. For our 31 international airports, I maintain the strategic guidelines in terms of our customer service standards. There are five values that we live by: (1) safety—this is our number one value; (2) caring, which is about being responsible to the local community and each other; (3) fun—we are a little bit more edgy than your average carrier; (4) passion; and (5) integrity—we operate at a high level of transparency. I work to establish the necessary infrastructure to achieve those values, meeting with local partners and government agencies to evolve service standards and maximize operating efficiencies. HE: How do you implement these values overseas? GC: We’re very big on corporate social responsibility. One of our missions is to inspire humanity. So, aside from operating in various international airports, we want to introduce JetBlue in the best possible way to the local culture and be a good neighbor. Overseas, we hold social responsibility events. For example, in Santiago, the Dominican Republic, we recently offered opportunities for families with autistic children or family members to experience the airline. We’ve seen that air travel can be very stressful even for people who don’t have these disabilities, so our in-flight crew members, and other airport volunteers took those special-needs passengers through the travel ribbon like a drill, from the check-in process, to the TSA, to local immigration, to boarding their flight, and even around the runway. HE: On a day-to-day basis, what are the different aspects you handle in overseeing the international airport system? GC: Aside from operating standards to our core values, we look to adapt to the cultures where we’re setting up operations. Most recently, we started operations in Port-au-Prince, in Haiti, which marks the first time we are operating on an island that is not Spanish- or English-speaking. They speak mainly Creole and French. It was very challenging, but we spent a lot of time on the ground, understanding the market, and selecting the right business partners and right leadership. We are very humble; we try to learn the culture and insert ourselves in a very respectful way. In Haiti, they are still recovering from the earthquake of just a few years before, so it wasn’t just about building office space. There was a lot of listening to the community about their needs. HE: What are the biggest challenges you have faced in overseeing the international airport system? GC: We are the largest operator in the New York area. 80 percent of our flights originate or funnel through New York air space, which is one of the most congested. This is definitely an ongoing challenge, but it’s allowed us to get better at our operations and to plan ahead. This past winter’s weather gave us some great practice. And when we feel that we haven’t met customer expectations, we listen and focus on how we can adjust to their needs. HE: Can you expand a little bit on JetBlue’s international strategy? GC: Our strategy has been to operate at competitive costs while offering competitive fares. We are very interested in the Caribbean and Latin American markets and have seen a great amount of growth in a short amount of time. We are expanding services in Mexico and Colombia and continuing to service Cuba via charter flights—and are ready to expand once restrictions are lifted. We want to serve the underserved and bring a higher service standard. One of the things that we’ve seen specifically in this region is, when we go into a new market, the fares across the board are lowered by an average of $64 for round-trip flights. On the technology side, we just announced Apple Pay as part of our commitment to stay innovative. We are the first airline to deploy it. HE: What’s it like for you now to take one of those flights into Puerto Rico’s Luis Muñoz Marín International Airport? GC: It’s been a great honor. I take many flights on a weekly basis, but there’s something special about going into these markets. It’s home.